George Hildebrandt grew up on his family's farm near Hudson, NY. From his father, he learned the importance of honesty and integrity. These values would one day lead George to success in the trucking business. 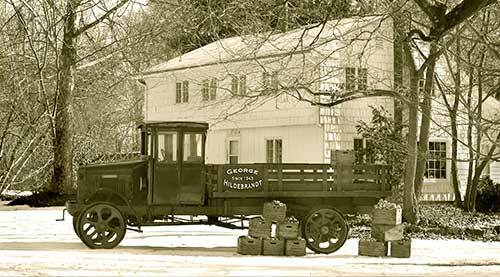 In 1943, George purchased his first truck to haul fruit and produce from upstate New York to New York City. Through perseverance and hard work he expanded the size of his fleet, providing shipping services to all parts of the Northeast. George introduced his grandsons, Alfred Bartolotta and Rudy Hayes, to the business at an early age. Under George's guidance, Alfred and Rudy learned to appreciate the traditional values of their grandfather. Today the company is owned and operated by Rudy, who runs the business by adhering to George's beliefs in three essential ingredients of success: Safety, Customer Satisfaction, and Employee Respect. We do this time and time again building consistency in who is handling your loads.